I don't have a computer to do my design on or to email it? I need my badges in a hurry as my band is going on tour! Email us straight away with your order and we'll let you know how quickly we can get you them. Yes, we accept credit cards securely through PayPal. There is no need to be a member. Can I have more than one design within my order? 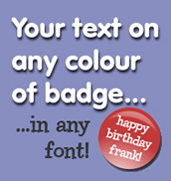 Please note that if you do want multiple designs then the number of badges per design is split equally. So, for example, if you ordered 200 badges and wanted 4 designs, you'll receive 50 badges of each design. Please note, if you do require different different quantities of each design then you won't benefit from this fantastic deal and have to pay a bit extra. Please contact us if you are wanting different amounts. Do you offer discounts to charities or schools? With our large focus on keeping such low prices our profit margins are so teeny and we sadly can't offer any discounts. 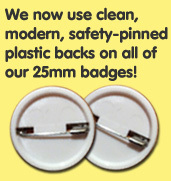 We are very sorry about this as we do provide badges for many charities and schools. 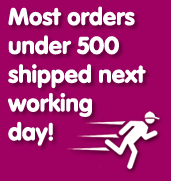 What we can offer is to move your order to the front of our order queue though! Can I collect my badges from you? We are based in the southside of Glasgow and are happy to arrange this is most convenient for you. Please email and we'll sort it out no problem. Do I have to wait for my cheque to clear before you start on my order? Yes, that's why we recommend paying online using our order form. I don't actually have an image for my badge, I just want text on a badge. Is this possible? Of course. Give us the word and a list of preferred fonts. We have many fonts but chances are we may not have your 1st choice. We can even send you a JPEG for your approval before production. Yes, but please email [email protected] for a customised quote.